Scott County members participate in 16th Annual MLK March! For the 16th straight year, the Georgetown-Scott County NAACP Unit celebrated Martin Luther King, Jr. Day with a march and program commemorating the legacy and message of the late civil rights leader. In the current environment that we are in, with growing income inequality, elected leaders playing to racial and religious differences, and a struggle to define what it means to be American, it was an important day to stand together. In a historic win for Fairness in western Kentucky, Paducah has become the ninth city in Kentucky to adopt an anti-discrimination ordinance that protects LGBTQ+ people. On January 9, more than 250 people packed the Paducah City Hall chambers, about two-thirds of the crowd showing support. After lengthy public testimony and debate, the measure passed by a 4 to 1 vote. The ordinance prohibits discrimination in employment, housing, and public accommodations. An amendment to include exemptions for religious business owners failed by a similar 4 to 1 vote. Such an exemption exists in state law, however. What’s the difference between diversity, inclusion, and belonging? How does oppression impact people and environments? What are potential next steps for KFTC? In Kentucky, LGBTQ people can still be fired from a job, denied a place to live, or kicked out of a restaurant. RALLY with us for a Statewide Fairness Law! 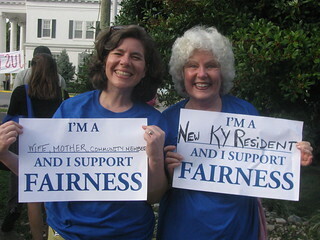 Scott County members and allies have continued the push for a fairness ordinance in Georgetown, and hope to build upon the success of the campaign over the past year.